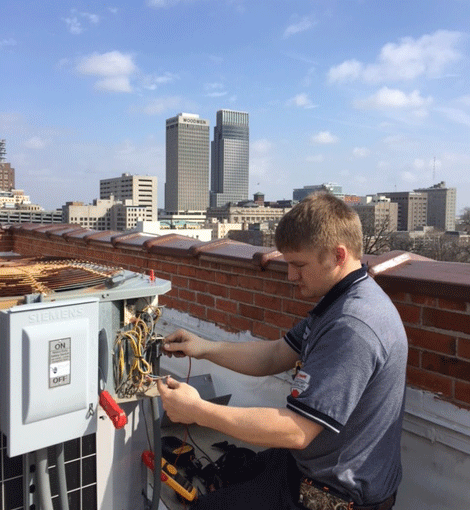 Fred’s Heating and Air provides HVAC service and maintenance for hundreds of commercial businesses around the Omaha and Council Bluffs area. In commercial settings, flawlessly performing HVAC systems are essential to productivity and business operations. Investment in long-term preventative maintenance helps you avoid inconvenient breakdowns and expensive repairs that disrupt business and decrease productivity. Additionally, planned maintenance dramatically extends the useful life of commercial heating and cooling equipment. Our commercial heating and cooling maintenance program is one of the most comprehensive in the area and helps minimize inconvenient breakdowns and maximize system life and performance. Our most popular plan includes four visits per year. Two of the visits involve a full tune-up of the heating and cooling sides of your HVAC system (including filter changes). During the other two visits, timed quarterly between the semi-annual comprehensive cleanings, we do visual inspections and filter changes. For some businesses, more appointments are necessary due to the stress placed on heating, cooling, and ventilation equipment throughout the year. At Fred’s, we cater our maintenance program to your specific needs. Looking for a Different Commercial HVAC Service? At Fred’s Heating and Air, our commercial HVAC technicians can do more than provide maintenance for your heating and cooling systems. We offer commercial HVAC installation and repair services from warehouses to office spaces. Whether you’re looking to replace an outdated system or ensure that your new construction project is equipped with the latest technology, we’ve got you covered. Our long-standing relationship with engineers enables us to deliver the highest-quality commercial HVAC design and build projects to the Omaha area. Call us today to schedule your free estimate or speak to an expert about any HVAC service questions you may have!